The Library and Research Skills module in ELE has lots of information to help you to find out about effective information searching and research skills, and discover more about the different kinds of library resources available to you. The suite of video tutorials provides quick and easy to follow demonstrations of library and research techniques, e.g. 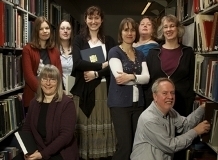 finding a book, an electronic book or a journal article on the library catalogue; booking an Express Collections item; accessing and searching particular research databases. There are also short films introducing you to different library services, spaces and facilities. Take a tour of the Forum Library and other study spaces at the University. Learn how to use the issue machines. Or meet your Subject Librarian team on film. Simply pick the topic you’re interested in from the picture menu to learn more about referencing, information skills, journals, research databases, using the Internet and much more. 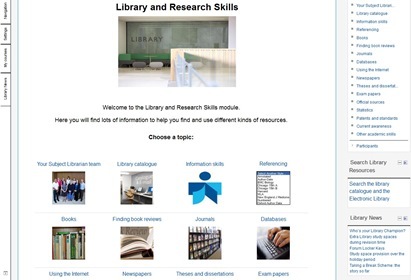 Each College also has its own Library and Research Skills ELE module tailored to your subject needs; navigate to the appropriate one via the ‘Library’ menu. This entry was posted in Information skills, Referencing and tagged how to guides on 21st Jan, 2014 by Caroline Huxtable. This is a question Library staff hear quite a lot, and the answer is, yes there is: it’s called My Reading History. The bad news is it’s not automatic, it’s something you need to opt into. This is due to data protection issues. However, your borrowing history will be recorded from the moment you opt in onwards, so the sooner you do this the more useful it becomes. To opt in, all you need to do is log-in to your Library record online, either via the Library tab on MyExeter or by clicking the patron record button on top right of the Library Catalogue screen. If you have not already opted in to the scheme you will be informed that you have now reading history currently available and should see a box marked ‘opt in.’ Click on this. Once you have opted in, logging in using the above method and clicking on the ‘My Reading History’ button will bring up a list of all the items you have borrowed since you opted in. Clicking on the title of any of them will automatically link through to the full bibliographic details of that item as shown in the Library catalogue – this can be useful for last minute reference checking! Once you have a few titles collected in your Reading History list various options will become available to you, such as ‘Export Reading History’ which will allow you to email the list of references to yourself, or save them to a file. If you have further questions about ‘My Reading History’ or would like a demonstration of how to opt in then please speak to a member of Library staff who will be happy to help you. This entry was posted in Referencing and tagged how to guides, renewals on 3rd Feb, 2013 by reg206.